Greedy goblin: Do you really need it? The most basic rule of getting rich: "Spend less every month than you earn". It's true in all existing worlds. In Azeroth, on the top of all, easy. You don't have bills to pay. You don't have to buy food or shelter. You can stay in an inn forever for free and need food only for buffs. 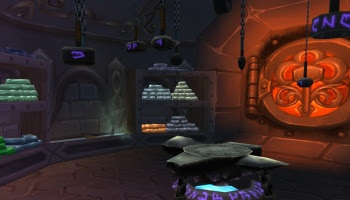 You don't have any unavoidable expenses in Azeroth! Everyone has income, no matter how little. If you have auctioneer and aware of opportunity cost, you have more than little. If you have accounting, you'll have lot more. So there is income. There are no expenses. Why don't everyone have full purses? Mostly because they spend like crazy. Before every spending, you should ask the question: "do I really need it?" This is the advantage of the Signet over the Spellshock. On my server the mats+gem+tip for the Spellshock are around 2000G. The Signet on revered reputation (this can be reached without farming, just by questing up and doing the cooking daily) is 6500G. Does +21 haste rating and a free hearthstone worth 4500G? Do you really need that +3 spell power for 160G? Does that spell power will make or break Naxxramas? Come on! Ensidia cleared not Naxxramas, but HC Malygos in lousy lvl 70 stuff. Their gear was much weaker than any casual's now. If you cannot clear Naxx, not +3 spell power but either learning to play or finding proper groupmembers is in order. Wrath Elixir vs Fel Strength Elixir. The difference is -10 stamina and -5G. Elixir of Spirit vs Elixir of Draenic Wisdom. The latter have -20 spirit, +30 intellect and -7G. Firecracker Salmon vs Smoked Salmon. The latter have -11 spell power and -9G. The items are tools to reach a goal. They only need improvement if the goal cannot be reached without them. Of course I'm not telling to walk around in unenchanted, ungemmed greens. But if the stat increase is marginal, you don't need it. If you have a crafting profession, you can spend thousands to reach slvl 450. Why??? Does it give you anything? The tradeskill specialty (like ring enchant, bracer embroidery and such), can be reached on slvl 410-420. Why do you push it higher? If you really need a crafted epic, you can find another crafter for a 50G tip instead of for a 1000G levelup! Graving for "better" items can come up with ridicoluous results. I've met an unforgettable mage back in ZA, who had epic gems in all slots but went out of mana at 30% of the boss and used wand. After the fight I asked him why had not use mana potion? "Because I can't afford it". Or the other one, I kicked from an instance group couple days ago after seeing no enchants and meta gem in his epics and also several greens. He arrived on a Red Drake! Absolute competitive HC raiders and PvP-ers. I can imagine that you do need that extra 3 spell power to down Satharion with 3 dragons. If you are in such guild, go for it! But if you are not even applying to such guild, you don't need it, even if you raid 6 times a week. Doing lot of easy content does not make you HC, just addict. People with obsessive compulsive personality disorder find internal happiness in reaching "better" items, even if they can't gain anything from it. If you don't feel good if your item is just blue, even if the stats are not bad and you can raid the content you want, you should consider seeking expert help. I mean it. If you have a guild leader who demands not better performance, but better items, /gquit today. An obsessive-compulsive boss can make your day terrible. People who like to look good (as opposed to be good). I'm absolutely positive that watching that boss video increases your damage done on him more than farming for a better gem. /ignore those stupid kids who linger around in Dalaran on their useless Mammoth and epic gems. The only thing they can kill is the poor squirrel at the well (and they usually do). If they would be not just a well-dressed piece of rock, they would be in a raid and not standing in the middle of Dalaran. You missed reason 4: PvP. No he did not, its number 1 in his list. And still PVP depends more on how you play, how you operate and how quick is your reaction. And those extra stats might be OK for Arena team member, which is more or less a proff with his talents set for victory over 2000rate, most times 2v2 grp. Meanwhile I, in BG`s with my unholy DK, which has absolute 0 posh of resilence and other PVP stuff, just few epics and talent tree for raiding - score most Dmg, less deaths. Just know the right spot where to show, pup up and stay back. Stats and additional power will not save your head if you dont have it over your shoulders. To add up - im getting fond of this blog, as the author is very simple and logic and Right Thinking guy, the type i like. Coming from an upstanding fan of your blog and a fellow Goblin; I disagree with the main message of this post. When one has an obscene amount of gold, what other purpose does it serve rather to upgrade your character in a small fashion? (about 20 extra SP from the jump to green to blue gems) As I see it there is no difference in hoarding more money than you could possibly use than buying a red drake. But yes, for your average player I concur that the gold could indeed be better spent. I think the main message in this post is that if you are buying things that are marginal upgrades, then complaining you don't have enough gold for healing/mana potions and the like, then you're an idiot. A while back I read a piece of advice that has served me well: don't buy any piece of gear on the AH until after you hit 80, you'll get decent gear from quest rewards and you'll save that money for other things you need, like saving up for your mount, training costs, etc. @Chris: this post was filed under "Middle class", for people who don't have lot of gold, exactly because they spend it. I have bought a red drake already, and a couple of other vanity items... but I also am in the 15k gold area... so it's something I can afford to spend gold on. You've got a great blog going here man, and I know I'll be a reader for a while to come - keep up the good work! I found your blog via Larissa's and I have the same feelings about it as she does. some things i agree with, somethings I don't, some things I find very uselful ad some I disregard as they do not apply to my personal gaming style. now that the introductions are done - I wanted to add another free mount to your collection, one I plan on getting fairly soon. War mammoth. purchasable for 300 stone keeper shards. if you're doing heroics on semi regular basis, chances are - some of them you do while your faction controls Wintergrasp. which means you are accumulating those shards without even trying. Unless you area jewelcrafter, bent on collecting every recipe in the game or for some reason need resilience gear - those shards are just rotting on your currency tab. so why not spend them on a mammoth? that said - I'm personally planning on purchasing red drake from Wyrmrest. eventually. why? i absolutely love the way it looks, and seeing as its game money, its not hurting anyone if I spend a bit of it on vanity items. this is the major problem I find with your blog to be honest - while its full of some very interesting advice, it also disregards to an extent the fact that people have different playing styles, priorities, goals for this game. and there's absolutely nothing wrong with that - it IS a game after all. the gold is not real its just pixels that you can trade for more pixels - its only as useful as it what allows you to acquire/afford. As long as my having smaller gold cushion then yours doesn't hurt my performance in a group/raid - who cares if I'm not rich? It's a simple concept, but the whole blasted U.S. economy is built on people behaving like idiots, buying stuff they don't need for inflated prices. Perhaps not coincidentally, the subscription model for MMO monetization functions on similar impulse/habitual purchasing mentalities. I agree that it is a lot of money for that last bit of stats. And I agree this is the last place to spend your gold. But once you can afford it, it may be a wise purchase if you may have to PUG or compete for spots in guild runs. How many runs do you have to miss because you have green gear/gems before it would have been in your best interest to have spent the gold. Think of it as like wearing a conservative tie to an white-collar job interview. It's not that the tie makes you a better employee, but if you don't wear a tie, you clearly are either ignorant of the norms or indifferent to success. As people make snap judgements about who to invite, why give them a reason to not take you? i've been reading your posts for a while, found this one today. i had been agreeing with everything you wrote, except this. if you have the ability to improve your gear (better gems, enchants, etc.) then there is no reason to not improve it. +3 spell power for 160 gold, that is about 53 gold per spell power increase. how much is spell power worth? is it worth 40 gold/point? 30? and who gets to decide. what did you have to do to get the upgraded item? if your original item was a quest reward, and you just picked up an epic in naxx, then you spent way more than 160 gold getting there, with repairs, gear, leveling to 80, flying mount, etc., etc. epic gear should have epic gems. that gear will probably last a while, gem it correctly. and if you have 8 or 9 gem slots on your gear, and you take the approach of simply gemming with cheaper gems, then that 3 spell power example, now becomes much larger, and effects all of your stats. even if you are stacking spell power in all 8 slots, that equals 24 spell power, all because you don't have enough sense to gem it with the best possible gem. and what if everyone in your group takes this approach? now in a 5 man, your losing attributes in 40 gem slots (8 slots per person, 5 people in the group). i guarantee you that your performance as a group suffers. sure it might not matter most of the time, but in that heroic run where the tank needed one more heal, or the boss needed one more hit, then that added gem saved you and your group from having to corpse run back in, pay repair bills, and try the boss again, it is worth it. I agree with this but on the other hand it does leave a bad taste in my mouth aswell. Let's say you have 10 gem slots, you gem 19sp in each instead of 16sp. You did pay 500g extra, but you gained 30 spellpower and gold will be made back in a day (as you know how to make gold if you read this kind of blogs). I think a lot of the exotic mounts are a waste of time and money, but after analyzing the time and gold cost of the exotic wotlk mounts, I decided to try to get the green proto-drake mount from the oracles faction for my hunter. Since the helmet you can get from them was an upgrade when I hit level 80, and the trinkets you can get from them at exalted were upgrades also, and their dailies are pretty quick and easy, I decided the overall cost of getting reputation was worth it for the MAIN reason that once I got revered with them, I could get an egg from them once a week for almost no money and eventually one would hatch into the green proto-drake. The overall cost compared to the overall rewards, in my opinion were very good. And luckily I did get the green proto drake mount very quickly. I think it looks better than the red drake you get from Wyrmrest and the Wyrmrest dailies take longer and there are less of them, plus for a hunter, Wyrmrest does not have other good rewards such as the Oracles have. So I think if you want a very special looking mount, you ought to be very careful what you are getting into, and choose one that does not require ridiculous amounts of time and gold. The green proto-drake does have only a 2% chance per week of dropping for you if you buy the egg once a week, but over time, your chances are good you will get one. Patience pays off very much! Maybe though if you wanted that red drake very badly and did not mind wearing the Wyrmrest tabard in the dungeons it would not be so awful. But better to get it on your warlock or mage since there are other reputation rewards, also. Just my two cents. Of course, you don't really need a special flying mount, just like Goblin says. Don't get caught up in the hype. Most people who got their flying mounts quickly want you to feel that maybe they are better than you. But deep down we all know that the type of mount you own does not mean you are better at anything other than using up lots of time.